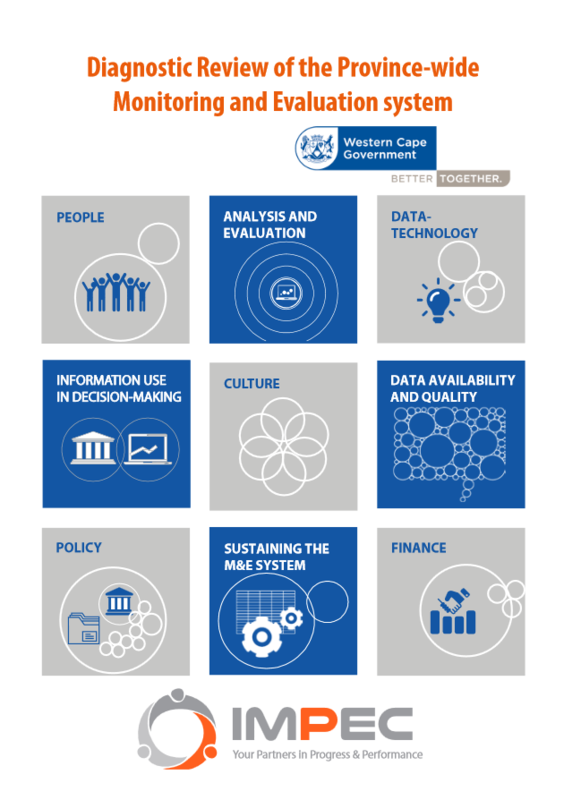 The Western Cape Government (WCG) has embarked on an important milestone in the development of its Provincial Wide Monitoring and Evaluation System (PWMES). After the compilation of its first PWMES framework in 2009, the system has matured through a number of phases. It has reached a stage where there is widespread awareness of the importance of Monitoring and Evaluation (M&E) and Results-Based Management (RBM) that has been integrated in M&E approaches and information management tools. With the purpose to well inform the following phase, a diagnostic review was commissioned. This review report describes the developments and achievements of the Department of the Premier (DotP); and in particular that of the Chief Directorate: Strategic Management Information (CD: SMI); that has been mandated with developing and steering the development of the PWMES. The report identifies opportunities for further development of the PWMES and presents concrete suggestions on how to take these forward. The conceptual model underpinning this diagnostic review has been informed by international practice in analysis of M&E systems as well as the PWMES results-chain developed by the CD: SMI. It focuses on M&E “building blocks”, which provide the vision, mandates and resources for M&E activities and include: culture, policy, people, technology and finance for M&E. These building blocks support the M&E “processes” of the PWMES. The processes include: availability of and access to relevant and good quality data; extracting insights and lessons through analysis and evaluation; strategic decision-making and sustaining the PWMES. It is assumed that the building blocks are largely within the sphere of control of the Premier’s department, whereas M&E “processes” stretch into the sphere of influence as they extend beyond the boundaries of the Department of the Premier, and are very much dependent on the motivations and capabilities of WCG staff members’. The diagnostic review process followed a participatory approach in that the CD: SMI participated in the formulation of the diagnostic review questions, the design of aspects of the diagnosis and report writing. This contributed to ownership of the process and findings of the diagnostic review by the WCG. A mixed-methods approach was used involving an electronic survey, key-informant interviews and focus group discussions. The main findings were included in a SWOT analysis, which informed the final recommendations.